Everyone is looking for something to complete them. Some are searching for the perfect partner. Some just want the perfect job or the perfect pet. And some people, somewhere out there, are searching for their dream financial institution. You and your future members could be a match made in heaven, but first, they need to find you. That’s where search engine optimization (SEO) comes in. There is a lot of mystique and techno-babbling about SEO. And while SEO wizards might know what they’re talking about, you don’t have to delve deep into search engine lore to be successful. In reality, you can often get on the first page of Google’s results just by focusing on the basics. 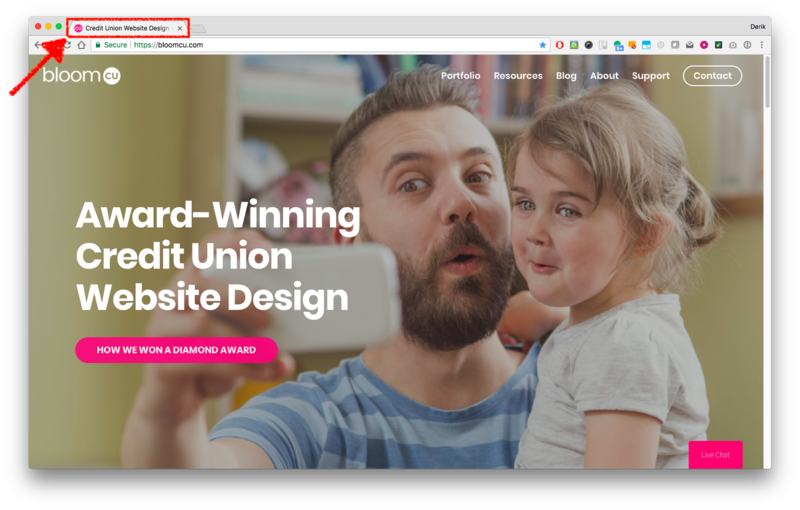 For instance, we got BloomCU.com into the Top 3 of the search results for the term “credit union website design” in about 6-12 months by focusing on just a few basic tactics. You don’t have to be an expert to make some smart SEO improvements to your website. 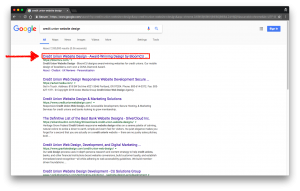 In this post we’ll explore a few relatively simple ways you can upgrade your SEO and get more people to your website. How does Google decide which web pages are relevant to a searcher? Google’s search results are based on keywords and link juice (yes, that’s right, link juice). When you type words into Google, those words are used to find web pages that use those same words (or synonyms). Duh, right? 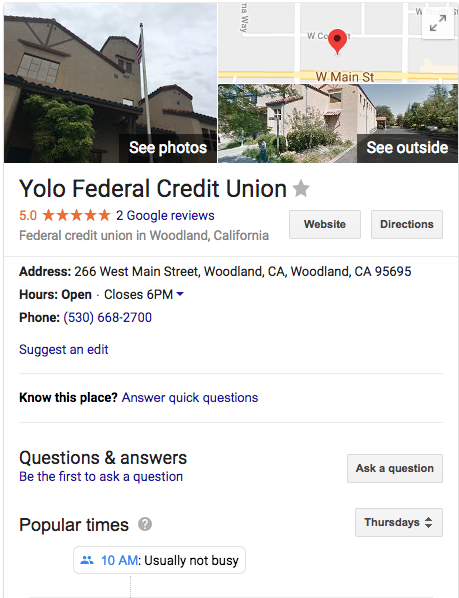 The implications are simple: if you want Google to show your credit union website in its search results, you have to use words people are searching for. When using keywords in your website content, don’t be spammy. Most people hate spam and Google is no exception (but Hawaiians are an exception). 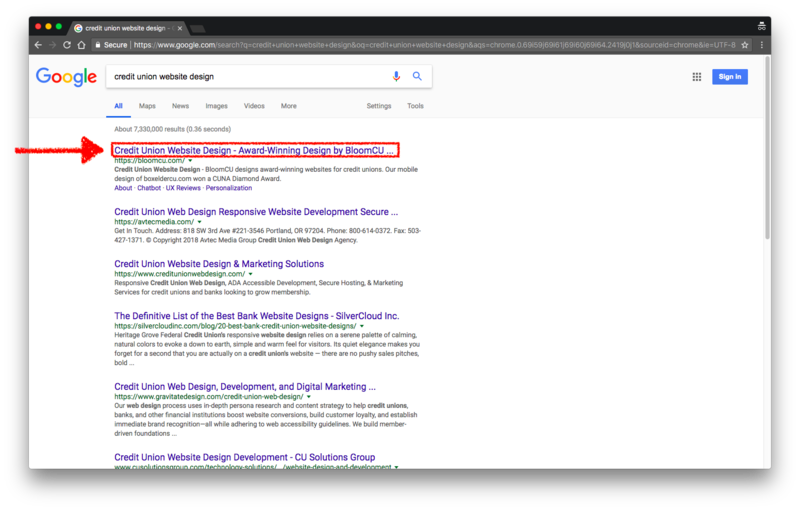 If Google thinks you are overusing a keyword phrase just so you will show up higher in its search results, Google will intentionally not show your web page. Google doesn’t want to show spammy results to searchers because that’s bad for Google. Just use keywords naturally in the text of your webpages. In particular, you should use keywords in Page Titles, Meta Descriptions, and Body Content. So, for every web page, write a Page Title that’s accurate, concise, and includes a keyword phrase. Meta Descriptions are hidden descriptions used by search engines. These descriptions are not shown anywhere within the content of web pages. Unlike meta descriptions, Body Content is what users actually see on a web page. Throughout the body content, use keyword phrases naturally (don’t be spammy, as we mentioned before). For instance, if you have a page about checking accounts, use the phrase “checking account” throughout the page, rather than just an inhouse name for the account, such as “TruChecking”. If Page A links to Page B, then link juice “flows” from page A to page B and that generally helps page B rank higher on Google. The more pages (and the higher-quality the pages are) that link to page B, the more link juice page B has and the higher it will tend to rank on Google. 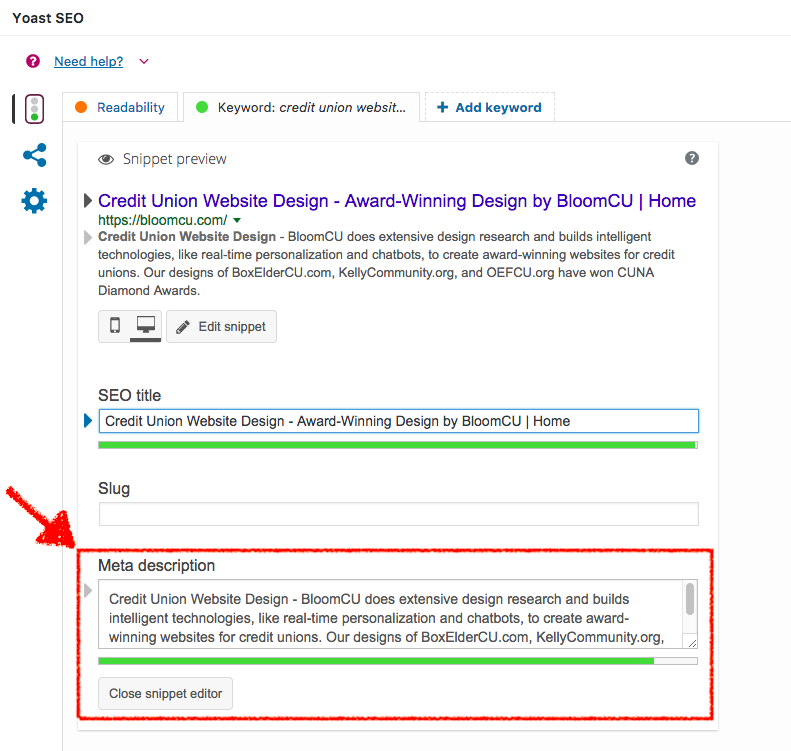 Above, I showed how BloomCU uses keywords to tell Google that bloomcu.com is about “credit union website design.” That was the easy part. The hard part of climbing to the top of Google’s search results was getting link juice. 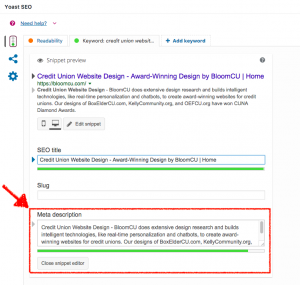 We earned it by creating lots of great content about credit union websites (like this blog post) and getting websites to link to bloomcu.com (for instance, CUInsight.com publishes lots of articles written by BloomCU, and those articles link back to bloomcu.com). 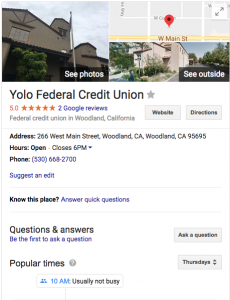 Local SEO is one of the most important tactics for credit union websites. Chances are, you aren’t looking to cater to everyone in the world because you have a limited field of membership. That’s why local SEO can be a good way to find members in the communities where your members live. 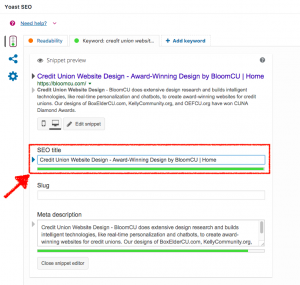 Note: If you’re not a community credit union (e.g., your field of membership is SEG-based), then SEO may not be a great tactic for you at all, frankly, because most Google searchers wouldn’t be eligible to join your credit union even if they find your website. How do you do local SEO? First, make sure your credit union has a local online presence. Check out Google My Business if you haven’t already, get registered, and make sure all the info is up to date. If you have more than one branch, you will need to register each location. If someone already made a local entry for your credit union, you can claim it so you can control the listing and make sure all the information is accurate and complete. You can also check out other local listing sites, such as Yelp, and make sure you’ve got a good presence there. Next, you’ll want to attract reviews. According to a detailed survey by BrightLocal, 84 percent of people trust online reviews as much as a personal recommendation, and 7 out of 10 customers will leave a review for a business if asked by the business. The same survey found a correlation between positive reviews and site visits. Customers said that after finding positive reviews, the next action they would take would be to check out the company website. A sizeable chunk also said they would visit the business in person. You might have a special blurb on your website that asks members to leave a quick review. You could also make the occasional social media post linking directly to a “leave a review” form. Chances are, if someone follows your Facebook page, they’re going to write something positive. You could also ask branch visitors to leave a review, maybe with a written notice strategically placed next to a basket of free candy. Extra tip: Want to quickly collect testimonials to improve your website conversions? Use your positive Google and Facebook reviews as testimonials. Google cannot rank your website correctly if it cannot read your website. Think of Google as a moderately-intelligent robot. It will crawl through your pages, but unlike a human person, it can’t truly explore them unless it understands their structure. It needs a sitemap that’s clearly delineated and organized by hierarchy, not just a jumble of pages. For information on going the extra mile on site architecture and truly perfecting your navigation, check out our post on tree testing. The “content is king” SEO strategy is more true than ever, particularly as Google continues to crack down on spammy tactics. If you write beautiful, engaging, informative content, and get it in front of your audience, you will get more potential borrowers and members visiting your website. As a credit union, you have built-in knowledge about money and everybody needs to learn how to manage their finances and grow their assets.Use a blog to educate others, and focus on providing quality information, not just quantity. If you have posts that are easy to read and rich in insights, people are far more likely to act on and repost them, even if you only have time to publish one article per month. You should also share your content on social media. Social media posts immediately create backlinks to your website (transfer link juice to your site) and may even lead to other backlinks. Let’s say you share a blog post about easy budgeting tricks on your Facebook page. A woman sees it, loves it, and posts it on her popular mommy blog—that’s a link you can take straight to the bank. 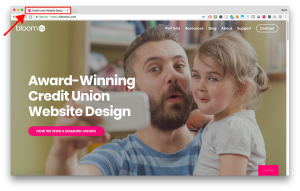 I can tell you BloomCU has benefited significantly from being near the top of search results for “credit union website design” because credit unions seeking a design agency frequently find us through Google. But, despite what some people may tell you, SEO is not for everyone. It can be a very valuable part of an overall marketing strategy, but it requires significant resources to produce good results—just like any other worthwhile strategy. Typically, you have to work on SEO consistently for several months before you’ll start to see increases in your search rankings. So, give some thought to the costs and benefits of SEO for your credit union before jumping in. 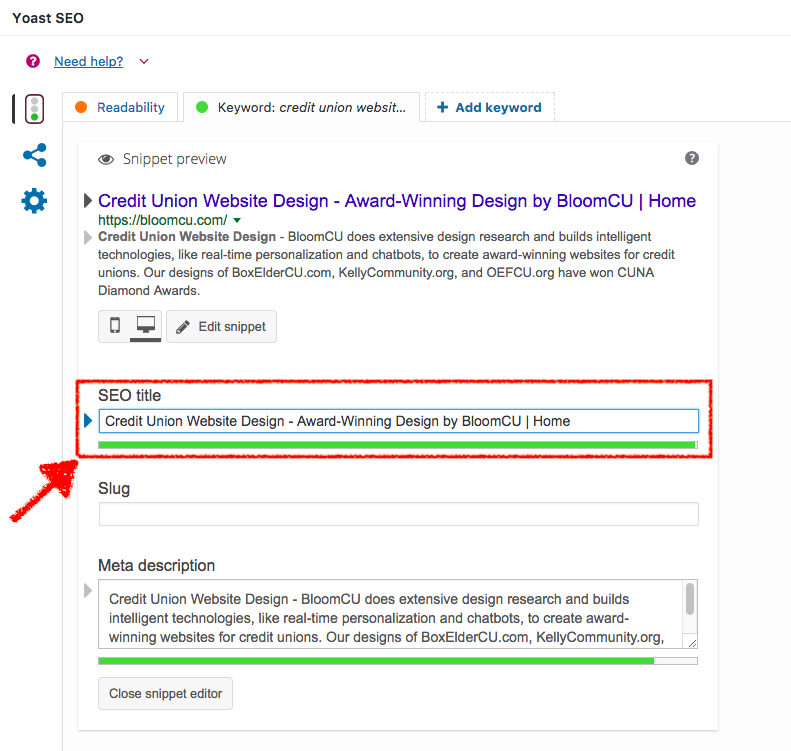 If you believe SEO is a great strategy for your credit union, stick to the basics, be consistent, be patient, and the rankings will come.